Located across the street from the Lenox Marta Station. 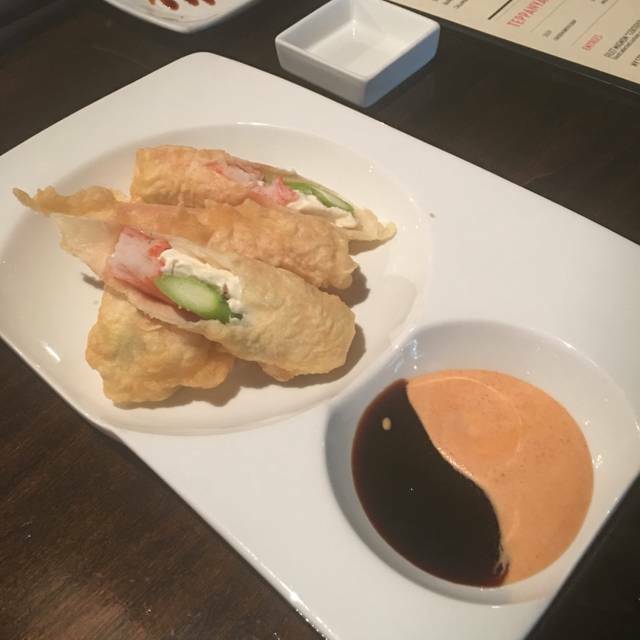 Katana Teppanyaki & Sushi brings a new distinctive excellence to Atlanta dining, with cutting-edge flavors, seasonal offerings, and exceptional service – Asian with a modern twist. 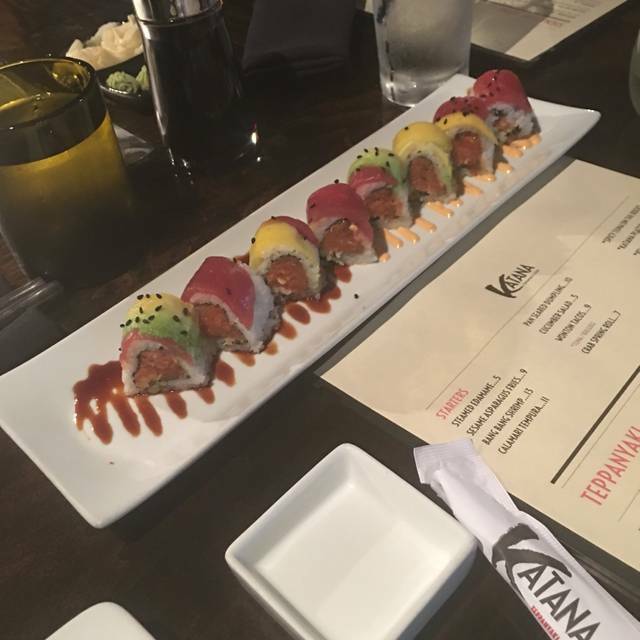 Katana is two distinct dining experiences in one location. 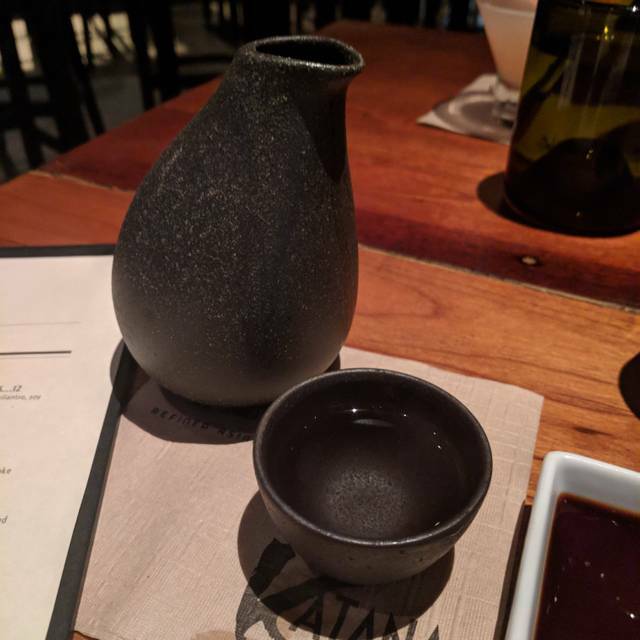 The Dining room is light, high-energy, casual, serving small-plates, made-to-order Sushi Bar, and a full-service Bar that includes our own private label Sake. The Teppanyaki room has a relaxing, Zen-inspired atmosphere with Teppanyaki-style open-grill stations complete with personal chef and server, where every meal is unique and made to order. 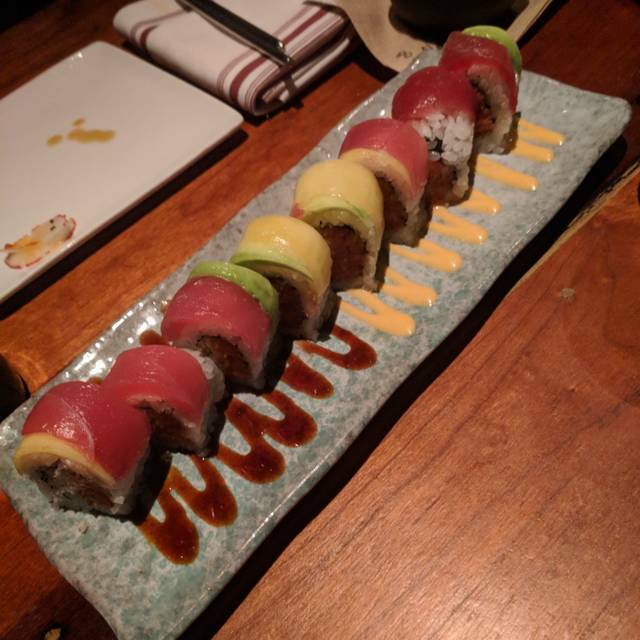 Good sushi, but the service was slow. 15-20 min to receive the drinks we ordered. We had to keep waiving the waiter to take our order and track down our drinks. Long delay for the bill and didn’t check on us during our meal. We had to ask for water refills. It got so bad we told the waiter to leave the pitcher of water. Katana was superb. We did Teppanyaki but have done the sushi side before as well. We had a wonderful experience with Chef Miguel. Great memories for us and our daughter. Steak, chicken, and shrimp were all excellent. Side of asparagus fries were to die for!!! Yum. No wait time... nice and professional presentation of the food and delicious!!! Not your typical teppanyaki experience, and I do not mean that in a positive way. It felt more like a club environment and they charge a fee for almost everything. To top it off, their bar service is ridiculously slow to the point where it is not even worth order a beverage. Never returning. I had a wonderful experience. My girl loved the food, service and the show from the cook. My night ended perfect. Thanks we will be back. 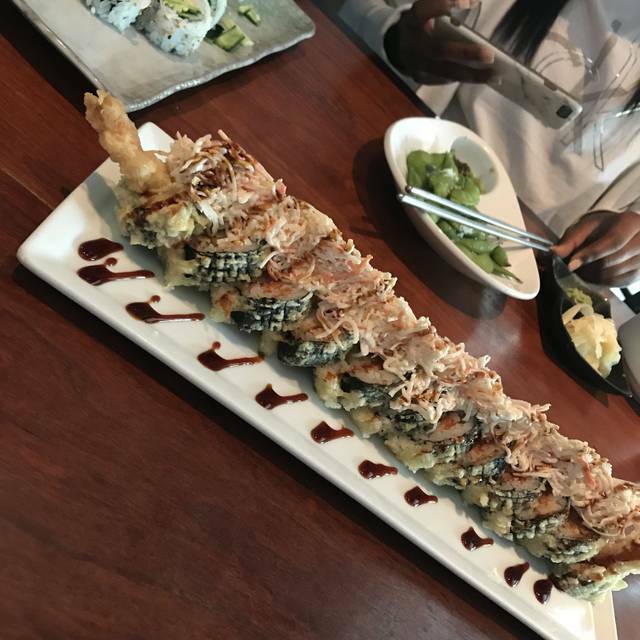 The sushi is amazing. That’s why we keep going there. Took my grand daughter for her birthday. Everything was gr8! Worst hibachi I’ve had. Over priced. Do not include vegetables or don’t offer combinations. Excellent service and Great food! Valet parking is complimentary. The service was great and so was the ambiance. However, The food was a disappointment. 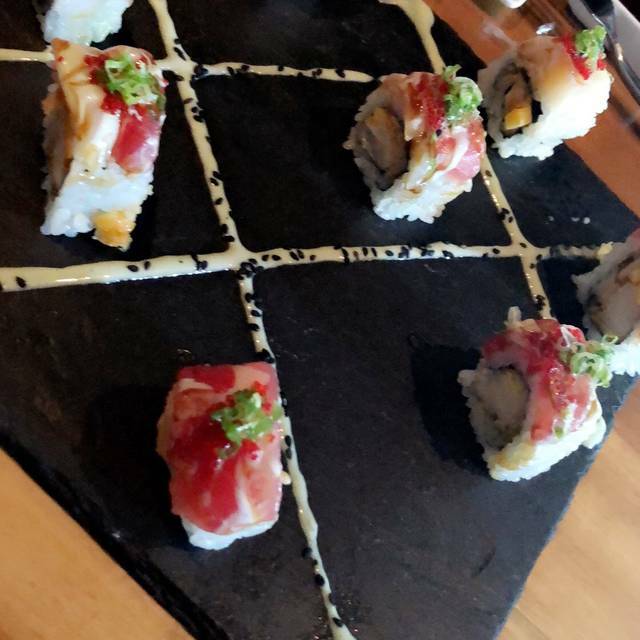 I was excited to try the sushi, but the texture was off and there was no flavor. I tried my friend’s garlic butter fried rice and it lacked flavor as well. Great food, very good service! We loved the restaurant. Our chef was very entertaining and the food was excellent! Everyone had a great time! Our servers and hibachi chef were fantastic, but it was bit over priced for what you get. You pay for every vegetable, if you want fried rice, and the meat portions are on the smaller side. Not sure we’d go back. I was not impressed with the teppanyaki at all. Food was just good but not amazing. I would recommend Nakato or even Benihana over this place. Great spot for Japanese cuisine! Food was outstanding. Atmosphere was very comfortable but also had a formal feel to it. Only downfall was that the service wasn’t the best. They were very busy so it was understandable and the food alone made up for it! 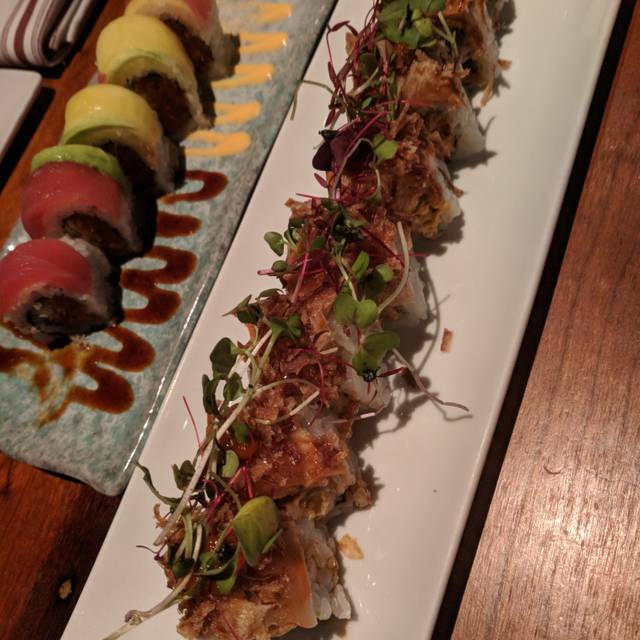 I would definitely recommend Katana! We came to celebrate my boyfriend’s birthday. We had a wonderful time. AJ our hostess was awesome. The food was great and we enjoyed the experience!! We arrived for an early dinner - 6:45. Parked and then had to live the car as we were told that valet parking was mandatory. No fee - one guy working for tips only. Dinner was typical Teppanyaki format. Our chef seemed newer and struggled with the theatrical aspect. Other diners had more skilled chefs at their grills. Food was good and plentiful. Wait staff was very attentive. Upon leaving, waited over ten minutes in the cold rain trying to get our car. Still a single valet who couldn’t keep up. Cars were backed up onto the main busy road trying to get in. He was confused on keys so we had to retrieve our own, and the car was only 20 yards from the door. This had some drivers fuming. Fantastic food, great service and great atmosphere. Food and atmosphere were great. Wish that the Hibachi was available during lunch. This is the first Teppanyaki where I needed to ask for salt & pepper after receiving my main entree. The Teppanyaki chef did not season the shrimp, chicken, or veggies. The ginger salad dressing tasted spoiled (4 out of 4 did not eat it). The dipping sauces provided with the main entree were also inedible. I’m not sure who’s palate the food is supposed to be geared to but it was not mine. The most enjoyable part of the meal was the shrimp appetizer. Will definitely not return. I basically wasted $85 for 2 people. I should mention that everything is a la cart. Also, I had indicated that this was a birthday dinner but the birthday was never acknowledged. My husband and I ate here for New Year’s Eve. Overall, it was a good experience. 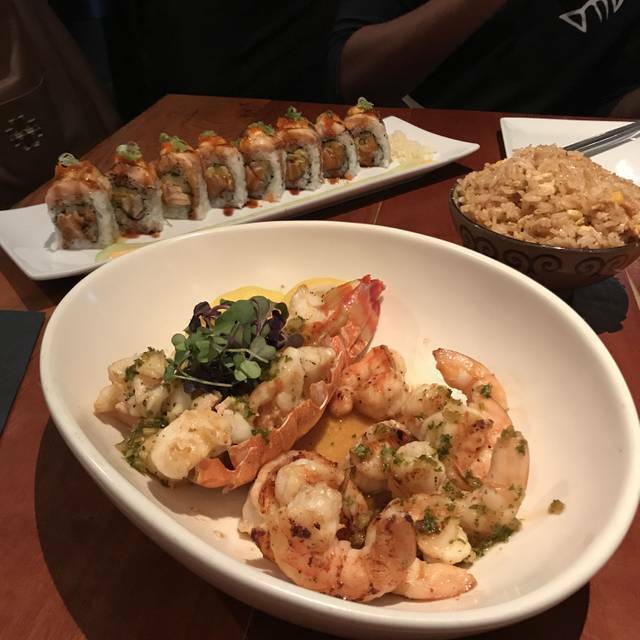 Appetizers were very good - we ordered the Bang Bang Shrimp, California Roll and Shrimp Tempura Roll. The Bang Bang Shrimp was a good portion, nicely breaded and not overly sauced/ mayonnaised. For dinner, I had the shrimp, and my husband had the filet. I wasn’t a huge fan of the sauce on the shrimp. The garlic butter fried rice is great, but a $3 upcharge per person. Also none of the meals are served with vegetables, so we ordered a side of mixed vegetables to share, which was plenty for us both. All Teppanyaki meals come with soup and salad. The ginger dressing on the salad is decent, nothing special. We also weren’t a fan of the sauces (ginger and yum yum) that came with the meal. Service was great and the appetizers boosted our overall thoughts on the restaurant. I would try again, but likely in the main dining room for sushi rolls and appetizers. We had the teppanyaki experience. The show was very good. Service was very slow, chicken and sea bass were over cooked. The sit down experience may be much better. By the end, was ready to leave as soon as I could pay my bill. We love having the chef cook in front of us! This is an upscale version of the restaurant we frequent in DC. They were very accommodating with my Mother who is in a walker - upcharge for fried rice vs white and veggies are also a separate charge - food was above average for this type of restaurant. Would definitely go again but plan for an expensive meal! We had our employee Christmas party here. It was a wonderful dining experience! We were celebrating my mother’s 5 years battle with cancer and currently in remission. We decided to go to Katana to celebrate this joyous event. We ordered drinks, but they were out of certain brands, we ordered some side items with our ribeyes and they were out of them as well. The chef seemed a bit new since he questioned our orders several times and this was while he was reading them off the waiter’s written notes( there was 12 people sitting on our table) which took a while. Some of us ordered medium rare ribeye as our entree, we clarified this twice, not counting when we originally told the server. The chef started cooking the fried rice and served it immediately on all of our plates. He then cooked some side items and tried to entertain us with the usual volcano fire and smoke show and the spatula being tossed around several times. After 20 years of seeing this, you would think something new would be added to the show. About 30 minutes later, our ribeyes made it to our plates. Needless to say the rice and vegetables were cold and most of it was gone because we were hungry and ate most of it while we patiently waited for the entree. To make matters worse, the ribeye steaks were cooked well done. At this point I asked for the general manager and when he approached us and asked how was our experience? I told him nothing but the truth, “poor and disappointing”. I explained our experience and his response was to educate us on how the process of Teppanyaki works. Telling us that in these types of restaurants, the process takes time and I shouldn’t be complaining. I clarified it wasn’t our first time and the whole experience was unacceptable. He did apologize at the end and took off some of the meals but the damage was done. From previous experience, I definitely know Katana has higher standards and can provide a better service experience! Very good food. I enjoyed it. Excellent staff and service. Dumplings and bang bang shrimp were very tasty appetizers. Never Say Never Again roll was very good as was the Twilight roll. Atmosphere was nice and service was very good. I would go back again. Great stir fry and service. I could eat there every week. Love this place, our server was AMAZING. We do wish there were a few more veggie options with protein, like a tofu dish or egg sushi. We love it there, so we'll def. be back. Well...... I would say I expect very high on Katana, but the result turns out to be unsatisfactory. I would say that the ambiance and service is good. Service much better than eight sushi Lounge. But the food is not hot when it comes up. For example, the filet and lobster is a little bit cold and the tasting is not impressive. However, the calamari and bim bim shrimp are tasteful and juicy. I will not pay a special visit next time to Katana. If I shop in Lenox and my friend wants to dine here, I will probably go. A group of 4 for lunch. We had a reservation and still had to wait with others with no reservation. 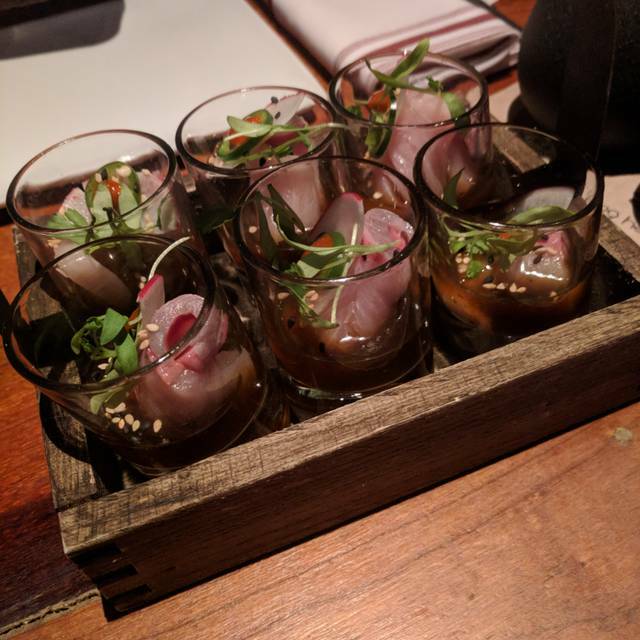 They forgot the sushi appetizer and when it arrived, it was very small. The rice was overcooked. The steak was dry and overcooked (medium well was the same as medium rare) and the shrimp was overcooked (liked rubber). Service was inattentive. Will not return.